I just got a phone call. One of those lovely automated messaging services that our pediatrician’s office uses to confirm appointments. You pick it up and after an abnormally long pause it says “This is Tara from blank blank healthcare. I am calling with an important message for insert name here“. They then proceed to recite to you your appointment date and time awkwardly. You then have to confirm or cancel. Blah, Blah, Blah. Well, every time the freaking thing calls me it has an important message for Gabrielle. I don’t have a Gabrielle! Never have, never will. 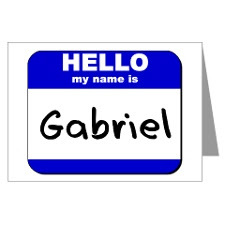 I have a Kindergarten BOY named GABRIEL! This isn’t rocket science! I can plug an interactive Elmo into my computer and type in his name, and even Elmo in his furry red glory will say Gabriel. We chose names that were not off the wall, but not Jennifer and John. Then number one names on both the lists the years we were born. I had three in my graduating class of eighty something. But by no means are our names unique. If you haven’t figured it out already, all four of our sons have biblical names. Seth is the third son of Adam and Eve-after that whole Cain and Able debacle. Nathan was a prophet who served both King David and King Solomon. Eli was a high priest and one of the last Israelite judges. And then there is Gabriel. The angel Gabriel. As in the story of the birth of Jesus in Luke. So here’s the thing. Although not the most popular of names, my sons were given wonderful ancient names. Nothing new. Nothing trendy. Nothing snazzy. I did not name my little boy in rugby shirt and overalls Ellie Noelle. And I most certainly did not, as one woman suggested to me, take the “le” off of Gabrielle. It’s not that difficult.And if you are having trouble believing me, I have a really old book you can look it up in. Right now the first choice name if we have a girl is Emmanuelle- we both love it although I fear it will be butchered her whole life. Our boy name is locked in at Judah. I love your boys names btw. Gabriel ahs always been a favorite although I cannot say the same for Gabrielle…weird I know.